Nancy Bruner’s will adds a new branch to my family tree! 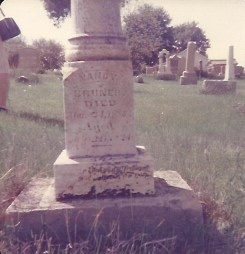 Nancy Bruner my GGG Grandmother’s headstone in the Veale Creek Baptist Church Cemetery in Daviess County Indiana. It is exciting when one document can change your family tree. This past weekend I found a will for Nancy Bruner. Nancy Bruner was my GGG Grandmother. I visited her grave with her grandson Thomas “Ed” Morgan by Great-Grandfather. We were visiting him in Washington Indiana in 1963. Nancy left 1/3 of her estate to her daughter “Elizabeth” Christina Morgan 1/3 to her daughter Rosetta Bruner and the remaining 1/3 to her grandchildren: Virginia Masten, Nancy A. Masten, Charles Masten, Cora Masten and Lucy Masten. What an exciting find! I knew about Rosetta Bruner because Nancy is buried with her two daughters Rosetta Bruner Thompson and Elizabeth Christina Morgan in the Veal Creek Baptist Church Cemetery in Daviess County Indiana. I was able to find the parents of the 5 children — Stephen J Masten and Laura Bruner Masten. And when I checked to see where Stephen and Laura Masten were buried – yes in the Veal Creek Baptist Church Cemetery! Many members of this family lived in Washington, Daviess County Indiana. Nancy Bruner referred to her oldest granddaughter as Virginia Masten. I found her using “Jennie” and she married Oliver Perry McCracken. I have not found any children for this family. Jennie Bruner McCracken died in Nov of 1950. Nancy Masten was born in 1872 and died in 1887 at age 15. Charles Franklin Masten was born 8 Nov 1876 and he married Glendora Myers Smead a widow in November of 1905 in Daviess County Indiana. They had four children Leigh born 1907, Elmer born 1911, Irene born 1914 and Pauline born in 1918. Cora Masten was born 6 Oct 1879 and she married twice. First to William S McCament in 1902, and they had a son Carl in 1907. She then married George Hinkle in Aug of 1920. Cora and George had two children Walter H Hinkle and Wilma Hinkle. Lucy Masten was born June of 1881 – I found her in 2 census records, but I don’t know if she married. I am looking for my new cousins! To think it all started with Nancy Bruner’s will dated 31st of March 1883.